T10 loudspeakers, V-SUBs and D80 amps installed at the first drama theatre to be built in Poland for almost four decades. 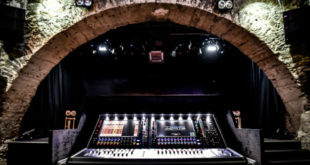 A wide range of sound equipment from d&b audiotechnik has been installed at the new Gdansk Shakespeare Theatre in Poland – the first drama theatre to be built in the country for almost four decades, requiring three years of construction work. Designed by Renatto Rizzi, an Italian architect and professor of the Academy of Fine Arts of Venice, the theatre is located on the site of an old wooden playhouse from the early 17th Century. 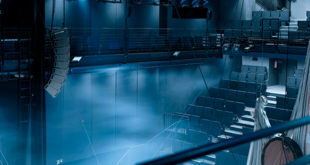 Konsbud Audio, d&b distributor and local audio specialist, was responsible for providing a technical solution to support the flexibility of the venue, with its adaptable auditorium that permits various stage configurations: a proscenium arch or in-the-round; and with what is believed to be the only retractable theatre roof in the world, the theatre can also transform into a traditional open air environment. d&b T10s – with V-SUBs for the low end – comprise the main system, and are powered by the manufacturer’s D80 amplifiers. 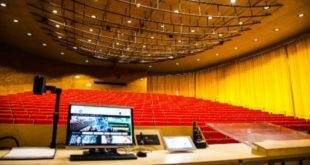 “We chose d&b audiotechnik products because the individual loudspeakers were the optimal dimensions, easy to install and offered high functionality,“ Jankiewicz continued. “The T10s also have a patented mounting system that enables the loudspeakers to be assembled and rigged as a line array by just two people. The T10 loudspeakers can work both in line source mode and in point source mode. 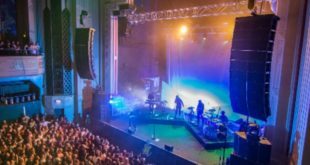 So the same loudspeakers can provide, during one performance, a line array system, and at another, they can be used individually as point sources for the purpose of sound reinforcement in the auditorium. For those seated in the galleries, small 4S loudspeakers are discreetly installed into the ceiling above each of the three levels – colour matched and incorporated in special housings to integrate with the architecture inside the hall.